I’ve heard a lot of World Mission Society Church Of God members claim that “Ahn Sahng-Hong had to preach the gospel for 37 years in order to fulfill the Prophecy of King David’s throne“. Let’s take a closer look at this claim. After being raised Buddhist, Ahn Sahng-Hong was baptized into the Seventh Day Adventist Church in 1948. After supposedly staying with the Seventh Day Adventists for 16 years, the World Mission Society Church of God claims they were founded by Ahn Sahng-Hong in 1964 (a point up for debate given that Ahn actually seems to have founded the NCPCOG). Some WMSCOG members have claimed that Ahn Sahng-Hong had to be baptized into the SDA church originally because they were the only ones worshiping on Saturday, however, Jesus was not baptized into another religion, despite having been raised a Jew and this also begs the question, why did he not just start his own church in 1948? To break down the math though, according to Ahn Sahng-Hong’s tombstone he lived from 1918 – 1985. First of all, I haven’t seen a baptism record, so I don’t know for sure if he was baptized into the SDA church in 1948 as some claim, but lets say for sake of argument that he was. If he preached for 37 years as the WMSCOG claims, then he would have had to start preaching in 1985-37=1948, supposedly the year he entered the SDA church. Interestingly, Jesus began his ministry and started his own church at the point of his baptism. Ahn Sahng-Hong, on the other hand, did not begin to preach the “new covenant Passover” until he established his own church. That’s strange, but what’s more interesting is that the WMSCOG admits on their own site that Ahn didn’t “restore the Passover” until 1964, a full 16 years later than the supposed 1948. (Completely ignoring for a moment that Herbert Armstrong “restored the Passover” in his Worldwide Church of God about 30 years before Ahn Sahng-Hong supposedly did). Therefore, by their own words, Ahn Sahng-Hong did not preach his “new covenant Passover” for 37 years as they claim, but for only 21 years! This further proves that he did not fulfill the “prophecy of King David” as the WMSCOG claims. We already have Ahn Sahng-Hong contradicting the Bible in Ahnsahnghong vs Scripture, and Ahn contradicting his own church in Ahnsahnghong vs WMSCOG. Now it looks like the church is contradicting themselves. Thus, even according to the WMSCOG’s own manufactured prophesies, Ahn Sahng-Hong can not God. Ahnshahnhong 37 Years or 21 Years? Preaching about the Passover & celebrating the Passover are two completely different activities. One can tell someone about something & not participate in the act. Also, one can participate in an act without telling someone else. 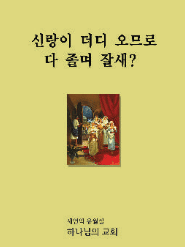 As I understand it to be, Ahnsahnghong-nim preached about the Passover since baptism but did not keep the Passover until 1964. Let us think about Jesus. The Scripture says He was 30 when He began His ministry. However, it is only recorded that Jesus kept the Passover once, the night before His crucifixion. But when we look into the Scripture, we see that Jesus died 3 years after He began His ministry. The Early Church of God was not established until the Passover was kept very similar to WMSCOG. Even though the Early Church wasn’t established until the Passover, does that mean Jesus did not begin His ministry at 30? Does it mean He began His ministry the night before He was crucified? No, because Jesus said after His resurrection to teach everyone everything He taught the Apostles from which He began teaching, from His baptism. Serious questions: Is preaching & participating the same thing? When did Jesus begin His ministry? When was the Early Church of God established in relation to His baptism? 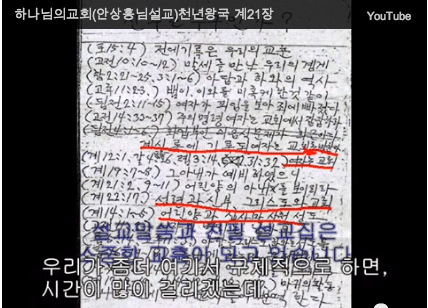 Added note… The date of Ahnsahnghong’s death suggest He was just over 36 when He died. I may have done the math wrong but correct me if I did. If I am correct, the WMSCOG preaches that without celebrating the Passover a person cannot have eternal life and is spiritually dead. So you believe that Ahnsahnghong preached about the Passover but did not celebrate it with any of his followers? He just let them walk around spiritually dead and without salvation? That just doesn’t make sense. And FYI Ahnsahnghong was born on December 1, 1918 and died on February 24, 1985. That would make him 66 years old when he died. The point is, Jesus was 30 when He began His ministry. However, Jesus kept the Passover the night before His crucifixion, 3 years after His ministry. Does it also mean He just let His disciples walk around spiritually dead and without salvation? That just doesn’t make sense also. You don’t know what you are talking about. FYI Christ Ahnsahnghong celebrated the Passover in 1962. So, everything you insists, sad to say, are all wrong.